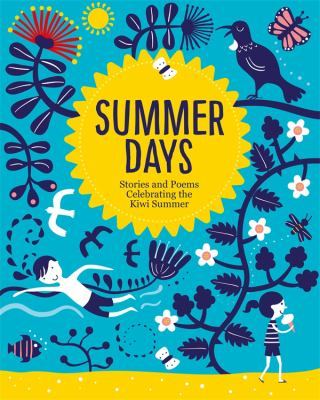 Summer Days : Stories And Poems Celebrating The Kiwi Summer - ubiq bookshop: the best place to buy books! This collection of seven stories and ten poems capture that quintessential summer feeling and is perfect summertime reading to share with children. Dive in to find all sorts of treasures by well-known New Zealand writers and illustrators, including Margaret Mahy, Joy Cowley, Gavin Bishop, Pamela Allen, Gwenda Turner, Fiona Farrell, Elena de Roo, Melanie Drewery, Sandra Morris, Sue Wootton, Brian Turner, Jenny Cooper, Vasanti Unka and David Elliot. This beautifully produced hardcover with sunny yellow-edged pages will get the whole family into the spirit of summer. Featured in the Spring 2017 Great Reads newsletter. Featured in the 6 November 2017 New Zealand / Pasifika Newsletter.